The British Rail Class 350 Desiro is a class of electric multiple-unit passenger train built by Siemens in 2004–05, 2008–09 and 2013–14. Thirty of these trains, designated Class 350/1, were built for use by Central Trains and Silverlink on regional express services and services on the southern section of the West Coast Main Line. A further 37 Class 350/2 were ordered by then operator London Midland in late 2007. All 37 units were delivered and in service by July 2009. A further 20 units have since been built, split equally between London Midland/LNR and TransPennine Express. The London Northwestern units are designated under the Class 350/3 subfleet, and the TransPennine Express units designated 350/4. The Siemens Desiro UK family also includes units of Classes 185, 360, 380, 444 and 450. The first order of Class 350 units were delivered in a neutral grey and blue livery, as they were operated by both Central Trains and Silverlink. The Class 350/1 units were originally part of an order for 32 five-car Class 450 units for South West Trains. However, they were never built as such. Of the 160 carriages ordered, 40 were diverted as an additional 10 four-car Class 450 units, and the remaining 120 were modified as 30 four-car Class 350/1 units. The top speed of the fleet was originally 100 mph (160 km/h), but all 350/1s were modified to allow 110 mph (180 km/h) running from December 2012, in order to make better use of paths on the busy West Coast Main Line..
A second batch of Class 350/2 units, intended to replace the Class 321 units, was delivered in late 2008 and during 2009. The first of the Class 350/2 was launched on 8 October 2008, and carried invited guests around the Wildenrath Test Track. The last of the Class 350/2 fleet (350 267) was officially delivered to London Midland on 30 July 2009. Class 350/2 differ from the Class 350/1 units in two key aspects: they have 3+2 seating in standard class (because they work short-hop commuter services, the Class 350/1 are 2+2 throughout, work longer distance services) and lack the dual-voltage capability of the 350/1. Initially, Class 350/2 units had a maximum speed of 100 mph (160 km/h), but the fleet was upgraded to allow 110mph running during 2018. This was to allow the operators to run mixed 350/1 and 350/2 services without causing delays, especially important given the capacity changes which HS2 works at London Euston were expected to cause. Class 350 trains are nearly identical to those of Class 450. The latter class is only fitted with traction equipment for Southern Region 750 V DC third rail, whilst the Class 350/1 units can operate from both 25 kV 50 Hz AC OLE, as is done in regular service, or alternatively third rail. This dual-voltage capability was utilised when several units were leased to Southern in 2008 and 2009, in order to cover for similarly equipped Class 377/2 units temporarily sub-leased to First Capital Connect, themselves to cover for delays in the construction of the 377/5 fleet. All Class 350 units built since are not equipped for third-rail use but, like most modern British EMUs, can be retrofitted if necessary. Every set of doors has its own set of guard-operated door controls behind a lockable panel. The cabs have three radio systems - Cab Secure Radio (CSR), National Radio Network (NRN) and the newest system, GSM-R. CCTV and dot-matrix destination screens are fitted throughout the train. The first Class 350 units entered service in June 2005 with Central Trains. 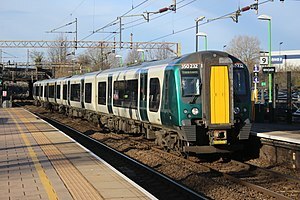 These operated on services between Birmingham and Northampton via Coventry, and all Birmingham - Liverpool services, replacing Class 170 units. Most recently Desiros have taken over some peak services between Birmingham and Walsall. Silverlink began operating in July 2005 between London Euston - Milton Keynes Central and Northampton. The Central Trains and Silverlink franchises expired in 2007. At this point, the entire fleet transferred to London Midland, the holder of the then new West Midlands franchise. As part of the agreement, London Midland embarked on the acquisition of a significant number of new trains, the largest order of which was for 37 additional Class 350 units. The first ten 350/2 units entered service in December 2008. In addition to the existing operations, these units took over the new Crewe - London Euston service running via Stoke-on-Trent and stopping at most of the Trent Valley Line stations. The London Northwestern Railway fleet is based at the purpose-built Kings Heath depot at Kingsthorpe, Northampton, which opened in June 2006 and can also service Class 321, Class 319 and other Desiro units if required. The TransPennine Express units are based at Siemens' existing Ardwick depot, with the government providing funding for the required electrification. Four 350/1 units were subleased to Southern from 2008 to 2009, to provide cover for Class 377 units subleased to First Capital Connect. After newer Class 377 "Electrostar" trains were built, these units were returned to London Midland. Ten additional four-car units were built for the London Midland franchise, to provide additional capacity, entering service from October 2014. All London Midland's 77 Class 350s were then inherited by London Northwestern Railway under West Midlands Trains from London Midland on 9 December 2017. Ten additional four-car units were introduced in 2013 for First TransPennine Express to coincide with the completion of the electrification of the eastern section of the Manchester to Liverpool via Newton-le-Willows line. These units are used on services between Manchester and Edinburgh / Glasgow, while the displaced Class 185s have remained with TransPennine to enhance capacity on other routes. The new trains have a revised specification allowing 110 mph (177 km/h) running with an intercity-style interior described as similar to the existing 185s. The first First TransPennine Express Class 350/4 services ran on 30 December 2013 between Manchester Piccadilly and Glasgow Central. The trains operate from Manchester Airport and Preston to Glasgow Central and Edinburgh Waverley. All ten trains have been delivered to TransPennine Express allowing most services on the Manchester to Scotland route to be operated using EMUs. TransPennine Express has 12 Class 397 Civity units on order to replace the Class 350s from Spring 2019, meaning that their 10 units will be transferred to London Northwestern Railway. London Northwestern Railway announced that they would be replacing all 37 of their 350/2 units for Class 350/4 units cascaded from TransPennine Express and brand new Class 730 units which both can travel up to speeds of 110mph. In October 2018, Porterbrook announced it was considering converting its fleet of 350/2s to Battery electric multiple units for potential future cascades to non-electrified routes. Most units are owned by Angel Trains, although Class 350/2 EMU trains are owned by Porterbrook. Uprated from 100 mph (161 km/h) top speed for December 2012. On 11 April 2011, a fire broke out in a toilet cubicle, following an explosion on unit 350 232 working the 16:25 from Northampton to London Euston as it approached Leighton Buzzard, resulting in the death of the female occupant of the toilet. Her death turned out to be suicide, as she carried a can of petrol into the toilet and locked the door. All other passengers and the train crew escaped unharmed. Damage to the train was not serious and it was repaired at Wolverton railway works. On 16 September 2016, unit 350 264 struck a landslide at the entrance to Watford Tunnel and was derailed. Unit 350 117, which was working in multiple, was undamaged. Unit 350 233 then collided with the derailed train. Two people were injured and unit 350 264 was severely damaged. The leading carriage of 350 233 was severely damaged, and all four carriages were damaged along one side. The consequences were not as serious as they could potentially have been because the derailed train was fortuitously kept from diverging too far from its line by equipment on the bottom of the train catching on the rail, meaning 350 233 struck only a glancing blow. On 10 November 2016, unit 350 264 was moved to Germany by low-loader, followed later by 350 233. Both units re-entered service in early 2018. Wikimedia Commons has media related to British Rail Class 350. ^ a b c "Central Trains launches Class 350 EMU". Archived 2 October 2011 at the Wayback Machine Railway Herald. Issue 11. Page 3. 10 June 2005. Retrieved 19 July 2011. ^ a b c d Desiro UK Class 350/1 Multiple Unit Archived 6 October 2011 at the Wayback Machine - Siemens Mobility. Page 40. Retrieved 19 July 2011. ^ a b c "Siemens hands over first 'Desiro' EMU" Archived 2 October 2011 at the Wayback Machine. Railway Herald. Issue 151. Page 4. 13 October 2008. Retrieved 19 July 2011. ^ a b c d e f New Rolling Stock for London Midland and for First TransPennine Express Archived 27 September 2013 at the Wayback Machine - London Midland. 14 September 2011. Retrieved 17 September 2011. ^ "West Midlands Franchise: Invitation to Tender" (PDF). Department for Transport. August 2016. pp. 78–79. Archived (PDF) from the original on 25 April 2017. Retrieved 16 August 2017. ^ a b c Class 350 Technical data Archived 4 September 2011 at the Wayback Machine - Angel Trains. Retrieved 27 March 2011. ^ a b c "Class 350/1 - London Midland". Angel Trains. Archived from the original on 13 October 2016. Retrieved 3 February 2016. ^ "London Midland completes £190m investment with final Siemens Desiro" (Press release). Siemens UK. 30 July 2009. Archived from the original on 6 August 2011. Retrieved 19 July 2011. ^ "Porterbrook Class 350/2 Technical Information". ^ "West Midlands Prospectus" (PDF). ^ Desiros for Loan to Southern Archived 28 September 2013 at the Wayback Machine - Southern Electric Group. Retrieved 6 June 2013. ^ "Silverlink launches the 'Class 350'" Archived 2 October 2011 at the Wayback Machine. Railway Herald. Issue 15. Page 3. 15 July 2005. Retrieved 19 July 2011. ^ Desiros for Loan to Southern Archived 28 September 2013 at the Wayback Machine - Southern Electric Group. Retrieved 29 April 2014. ^ Gibbs, Nigel (November 2017). "Vivarail 230s for new West Mids franchise as 170s to go". Today's Railways (191): 8. ^ a b c Rail Passengers in the North of England and Scotland to benefit from new trains Archived 28 August 2012 at the Wayback Machine - First TransPennine Express. Retrieved 16 March 2012. ^ "Electric trains boost" Archived 3 January 2014 at the Wayback Machine. Wigan Today. 3 January 2014. ^ "New TransPennine Express franchise launches". TransPennine Express. TransPennine Express. Archived from the original on 9 October 2016. Retrieved 25 March 2017. ^ Briginshaw, David (23 May 2016). "CAF to supply trains to TransPennine Express". International Rail Journal. Archived from the original on 8 May 2017. Retrieved 25 March 2017. ^ Barrow, Keith (16 October 2018). "Porterbrook plans Siemens Desiro battery-electric conversion". International Railway Journal. Retrieved 17 October 2018. ^ Class 350 - London Midland Archived 31 July 2017 at the Wayback Machine - Porterbrook. Retrieved 2017-07-31. ^ "Back from the grave". Flickr. ^ a b - EMU Pocket Book 2013 from Platform 5. ^ "Train named after former England Manager". BBC News. Archived from the original on 6 June 2017. Retrieved 2 June 2017. ^ "Woman dies in toilet cubicle fire on Leighton Buzzard train". Daily Mail. London. 13 April 2011. Archived from the original on 20 April 2013. Retrieved 31 May 2011. ^ Ikonen, Charlotte. "Hundreds rescued after train derails at Hunton Bridge, near Watford Junction". Watford Observer. Newsquest. Archived from the original on 17 September 2016. Retrieved 16 September 2016. ^ "Derailment due to a landslip, and subsequent collision, Watford, 16 September 2016" (PDF). Rail Accident Investigation Branch. Archived (PDF) from the original on 10 August 2017. Retrieved 10 August 2017. ^ "Derailed Watford Junction train makes final journey to scrapyard". Watford Observer. Archived from the original on 11 November 2016. Retrieved 10 November 2016. This page was last edited on 17 April 2019, at 17:02 (UTC).